Share food with those we love, with those we work with, even with complete strangers. All for that taste, that sensation that only food can bring. Would it be safe to say that you can remember the best meal you ever had? Can you remember the exact place that you had that exact meal? Maybe it could be said you even remember what you wearing during that fateful moment? What would you do if you could relive that moment every time you opened a bottle of Burns and McCoy? Condiments that will make your taste buds sing and literally make every bite that much better! A condiment that will erase all those previous memories of that amazing meal, and replace it with a feeling nothing short of elation. 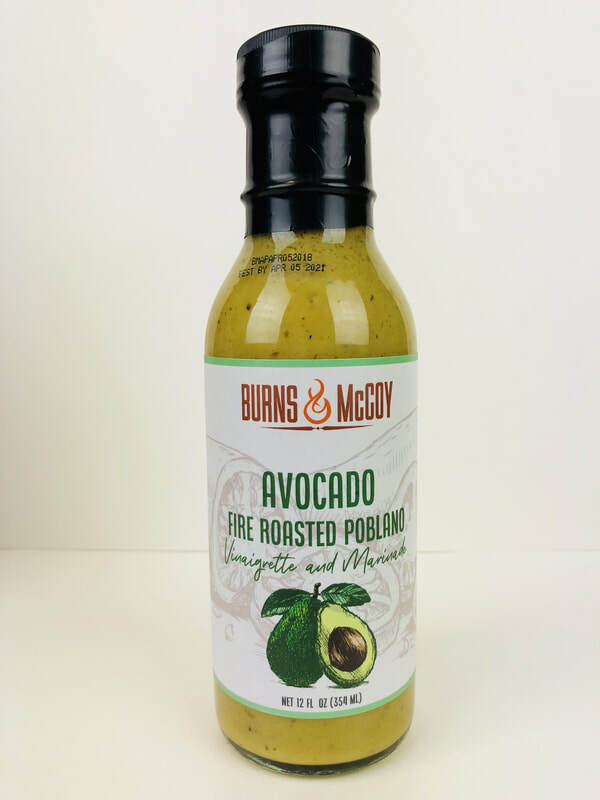 AVOCADO FIRE ROASTED POBLANO VINAIGRETTE AND MARINADE from BURNS & McCOY.. A smooth laid back flavor of avocado and a hint of fire roasted poblano pepper. Creamy and rich, with a hint of lime, just a touch of garlic and a splash of vinegar, shallots and mustard seed. This is a medley of flavors that compliment each other without being over powering. This is much more then an salad dressing, Its a great marinade for chicken, shrimp and lamb. Pour it on your favorite sandwich, burger or use it as a dip. Great stuff! 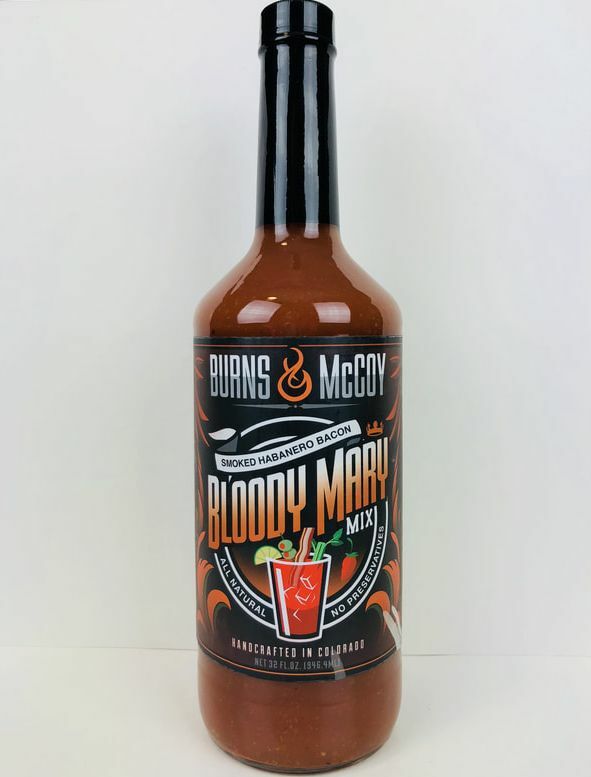 SMOKED HABANERO BACON BLOODY MARY from BURNS & McCOY.. Get ready for an entirely new twist on a bloody marry! SMOKED BACON!! Such an amazing flavor profile coming from every drop. 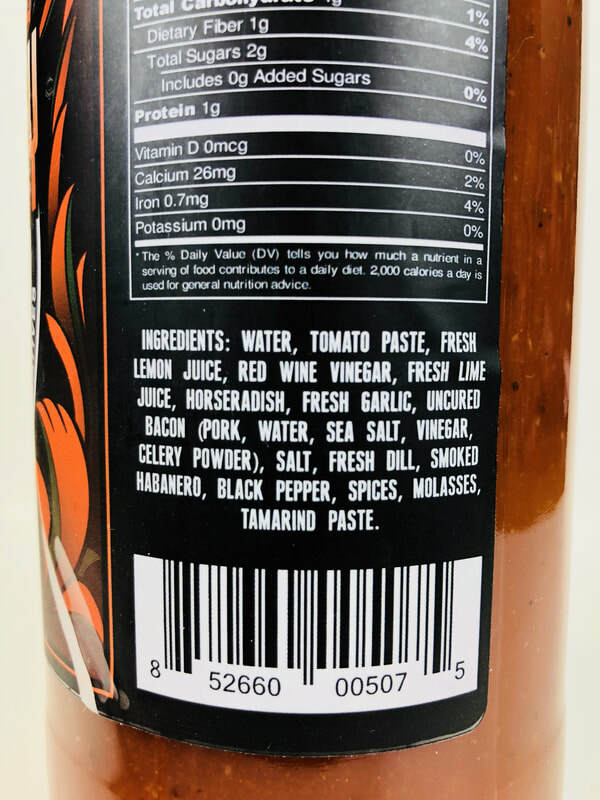 Tomato, lemon, lime, horseradish, garlic, BACON, celery power, smoked habanero, black pepper, a slash of vinegar and spices. Every ingredients comes through perfectly to give you a delicious, one of a kind bloody marry taste. Drink it neat, over ice or add your favorite spirits. Mix it into burger for the grill, use as a marinade or add it to stew. What ever way you choose to use it, it will bring a amazing extra pop of flavor to your food. I'm loving this! 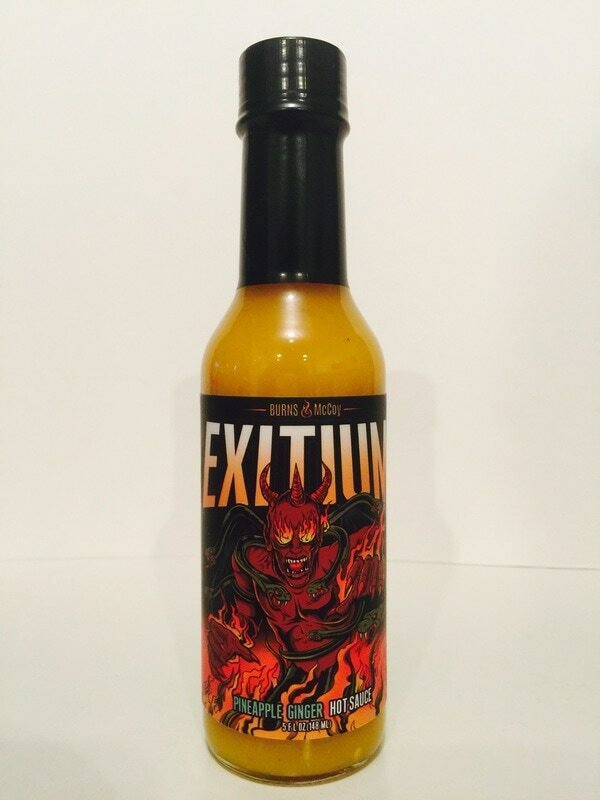 EXITIUM from BURNS &McCOY.. As Jay Turner says "when using this sauce tread lightly" and I have to agree. 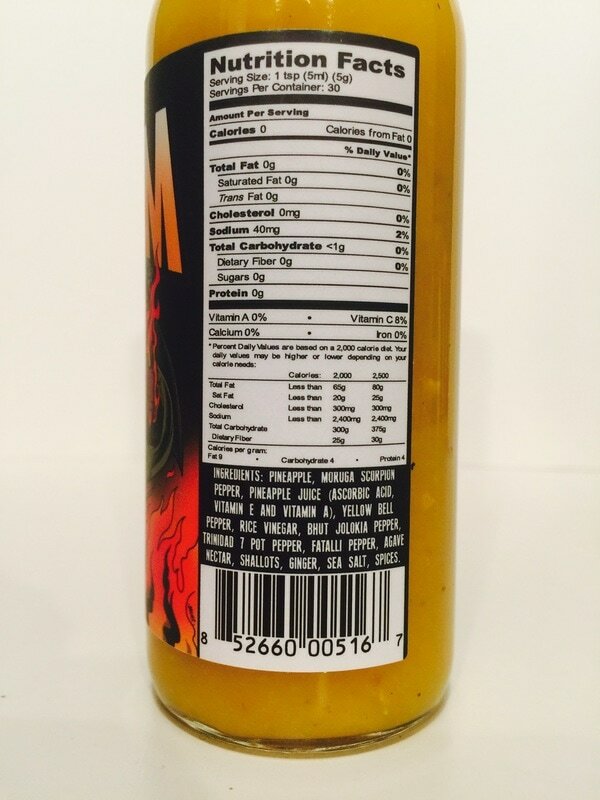 The true to life pineapple and ginger flavor is amazing but be weary as this is a VERY HOT sauce. The distinct flavor and heat of the scorpion pepper works very well with the pineapple. But the heat doesn't stop there, Jay then added more heat from the bhut jolokia, trinidad 7 pot and fatalli peppers. OUCH! 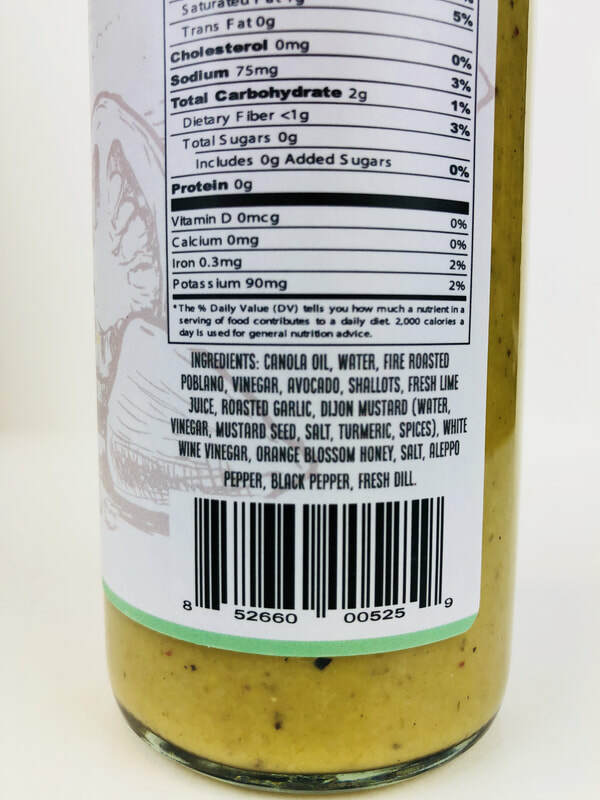 You would think using all these peppers in one sauce the flavor of the pineapple would be lost, not at all, its what really makes this sauce pop. You know the old saying pork chops and applesauce? Well now I can say pork chops and Exitium. Great job! 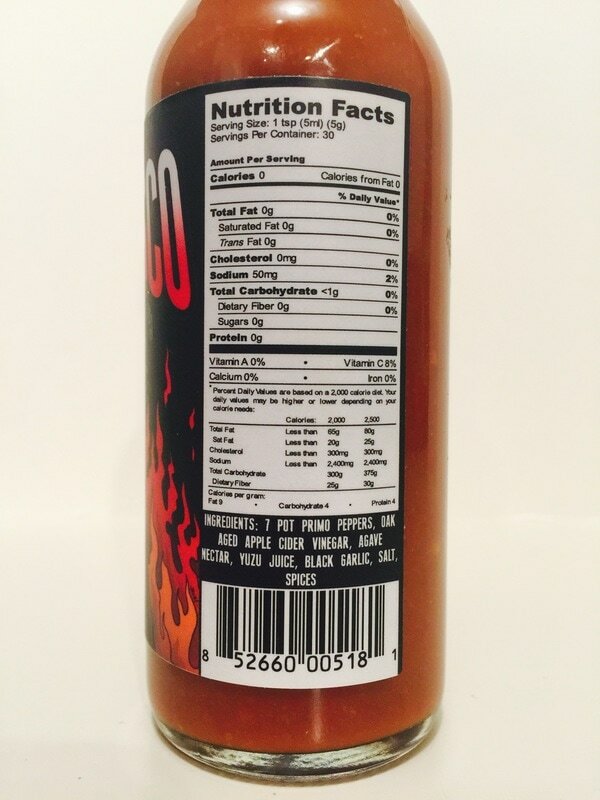 This sauce is a heat lovers dream! 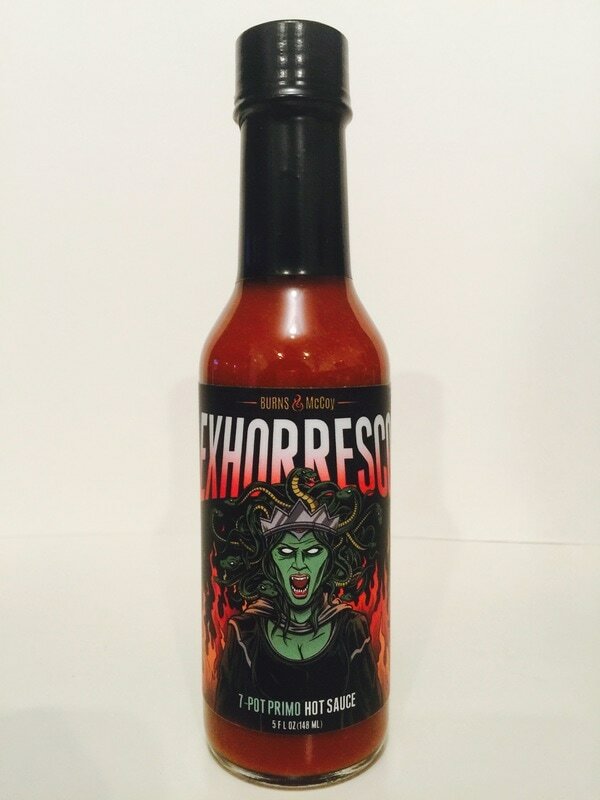 EXHORRESCO from BURNS & McCOY.. Another extremely hot sauce from Burns & McCoy. This is another super hot one from the 'Wrath of Gods' lineup and I'm hoping to get the rest of them soon. The first flavor coming from this sauce is a quick taste of sweet citrus from the Yuzu juice and then the heat jumps right in! The the heat and flavor from the 7 pot primo pepper kicks in and coats your entire mouth so once again, tread lightly, it's gonna be a long HOT burn! The flavor trails off with a little black garlic and a hint of Oak aged apple cider vinegar. I also used this sauce on pork chops and it paired great. I really enjoyed adding a few drops to ketchup to use as a dip for fries.